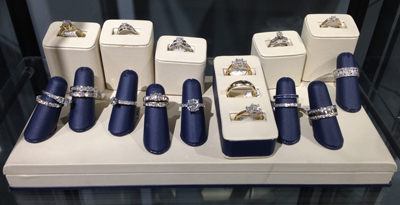 If you’re looking to purchase previously owned estate jewelry, we encourage you to visit our Wyomissing, PA location to view our selection in person. If you have pieces to sell, we would like to see what you have. Most estate jewelry is irreplaceable, which is why when you find a really good piece, it can be extremely valuable in terms of both buying and selling. With over 20 years of experience working with jewelry pieces of all kinds, Goldsmiths can provide you with an accurate appraisal of the exact worth of your estate jewelry. If you’re looking for something specific, we encourage you to visit our Wyomissing, PA store to view our selection in person. The definition of estate jewelry is that it was previously owned. Not all estate jewelry comes from the deceased or is vintage or antique. Jewelry must be at least 100 years old to be considered antique. Anything produced after 1940 through the 1980′s is considered to be vintage.